Just one day after returning from Seattle, I took off the performing cap and put on my teaching hat for the 2014 Boise State University Chamber Music Camp. I was a flute teacher for the camp and in charge of teaching fundamentals classes and creating/coaching flute chamber ensembles. 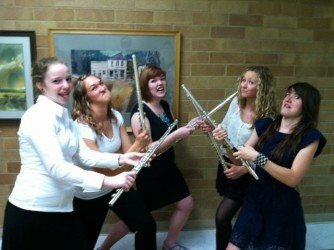 First of all, what a great bunch of flutists this year! I appreciated their enthusiasm and positive attitudes the whole week. This year our camp composers were Antonin Dvorak and Scott Joplin, so in the spirit of the camp, I found chamber pieces by these composers arranged for our flute groups. We had a quintet playing Joplin’s The Entertainer, a trio playing Dvorak’s Humoresque, Op. 101, and the flute choir working on Dvorak’s Slavonic Dance No. 1. Besides obviously having a good time, we learned about many important concepts, such as cueing without a conductor, intonation, fitting different rhythms together, staying in time, and making our performances exciting with articulation and dynamics. The growth from Day 1 to Day 5 was astounding! These girls really took charge of their own success. Other topics we covered throughout the week included stage presence, performance anxiety, mental recharging, performance analysis, and rehearsal strategies. Additionally, all of the students were able to observe primo chamber music in action with the faculty concert. 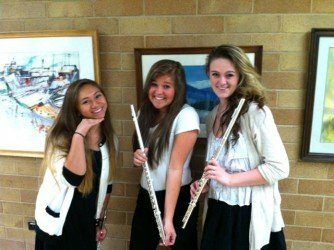 Amanda, Baylee, and I, with Krista on piano, performed a movement from Ian Clarke’s Curves for flute trio and piano. 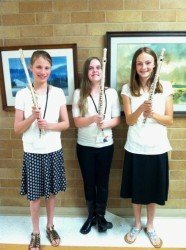 We were able to demonstrate not only good chamber playing, but also have some fun with extended techniques like alternate fingerings and pitch bends on the flute. If you don’t know Ian Clarke’s flute music, check it out on YouTube! With many so much fun happening – scavenger hunts, teddy bear relays, talent shows, “relaxing on the beach,” free jazz group improv – it’s easy to forget that we were actually at music camp! An amazing amount of hard work and superb music making all evidenced itself in the final chamber music and large ensemble concerts, and I couldn’t be more proud of these flute players.